Dramatic readings from the first installment of the "Gormenghast" trilogy by British science fiction author Mervyn Peake (1911-1968), adapted for WBAI's Mind's Eye Theatre by kind permission of the U.S. publisher Weybright and Talley. The novels concern the enclosed, created world of the great castle of Gormenghast and its inhabitants, ruled by ritual and torn by madness: Sepulchrave, 76th Earl of Groan (Albert Norton) prone to melancholia and obsessed with the death owls of the Tower of Flints; Gertrude, Countess of Groan (Rose Mary Anderson) who moves always with a carpet of white cats flowing about her feet; the Lady Fuchsia (Julie Scherer), their child who thinks everything is evil, except clouds, rivers and some rabbits; the mad aunts, the Ladies Cora and Clarice (Kathleen Dalton) who speak, act and think as one; Dr. Alfred Prunesquallor (John Wilson) and his sister Irma (Kathleen Dalton), he being perhaps the only sane inhabitant of the castle, she being anything but. The narrator is Larry Holpp; the technical director, David Rapkin, the director and adaptor, Baird Searles. Production assistant, Ellen Jaffe. 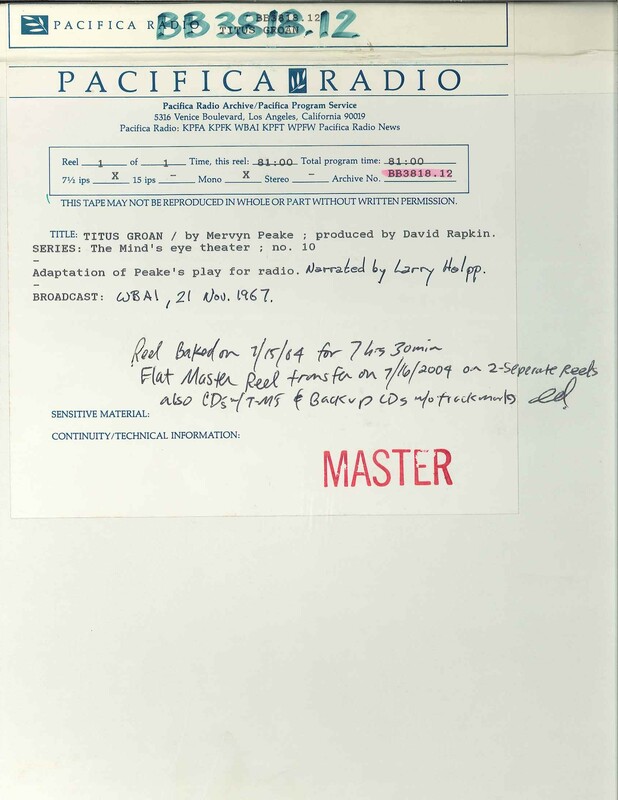 This recording was formerly cataloged as BB3818.12.